A good comic book property can’t sit idle for long, nor should it. Having waited an eternity (eight years) 20th Century Fox is finally poised to forget about 2007’s “Fantastic Four: Rise of the Silver Surfer” and reboot their family of superheroes with The Fantastic Four. Unfortunately, much of it appears to be an origin story (how many times does a reboot have to re-explain the beginnings?) outlining how the first family — Reed Richards / Mr. Fantastic (Miles Teller), Sue Storm / The Invisible Woman (Kate Mara), Johnny Storm / The Human Torch (Michael B. Jordan), and Ben Grimm / The Thing (Jamie Bell) — received their powers. There is, nonetheless, an obvious upgrade in the acting talent, screenwriting and look of the picture as evidenced from this first look, so there is plenty to be hopeful for (like the Doctor Doom reveal). See for yourself, in the trailer courtesy of 20th Century Fox. I wish they’d just give the property back to Marvel in full. Marvel isn’t the only shop in town that can make an entertaining superhero movie. Because I’d like to see FF become part of the Marvel cinematic universe. Well that was awfully serious! The origin story is needed for this one – they have to explain how a white Sue and a black Johnny are sister and brother. I’m going to go out on a limb and say one of them is adopted..
Or … a bi-racial family. That would REALLY push the conservative needle to overload. Definitely needed a reboot, err I mean a contemporary re-imagining. Miles Teller seems a little young to play Reed Richards though. The trailer feels like something I’ve seen before. Still I’m excited for this, the last Fantastic Four movie really hurt the franchise in much the same way Spider-Man 3 hurt the good Spidey name. Wasn’t expecting a grittier FF. Am pleasantly surprised by what I’ve seen so far. Where is the fantastic? All I see is ordinary. All these superhero movies are looking like one another now. It’s called following a formula, friend. 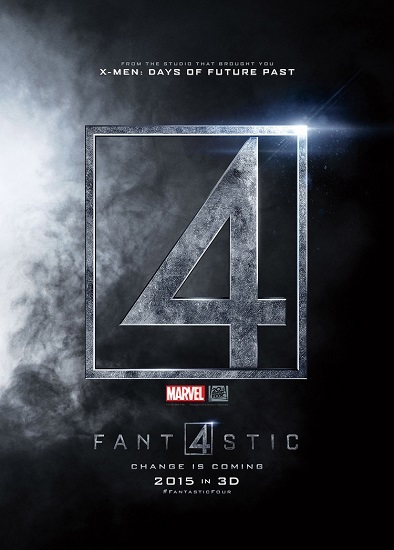 If it didn’t have ‘Fantastic Four’ in the title you’d have no idea the movie involves superheroes. This is more science fiction than comic fantasy. Looks like they’re following the “Ultimate Fantastic Four” storyline. After watching the trailer I can safely say I am more interested in Fantastic Four than I am in Antman. Irritating voice-over. So-so graphics. Questionable casting choices. I’m not teased.